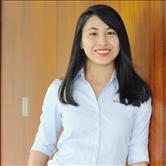 Ms. Katt Le joined our team after she graduated as Top in the School of Business, Can Tho University. During her 9 years with us, Ms. Katt's strong and passionated devotion for work have consistently brought successful business and happy partners. Ms. Katt business goal is to victoriously help aFishDeal company expanding and maintaining relationship with honored business partners; and she has done a great job! Ms. Katt is enthusiastic, cheerful, and well-organized. We are very lucky and grateful to have her as one of our most extraordinary Customer Expansion Managers. Mr. Phong Chau has been with our team for almost 10 years. He is very well-known for his dedication and care for customers, and moreover for his expertise in Fish and Seafood industry. Mr. Phong is not only a truly model for us all, but also a trustworthy friend to his customers. Mr. Phong has a wonderful life with his family. His credo of life is "Simple is the best." Ms. Jessica Hoang is our great expert not only in Customer Relation Management, but also in Custom and Government Relations. We are so glad to have her in our fun and motivated team for more than 8 years now. Besides her big contribution to aFishDeal's growth, Ms. Jessica is also a very important member in our Social Team. She spends a lot of time visiting and supporting families with difficult situations in the South of Viet Nam. With her help, our Social Responsibility Programs always have good results and strong impacts to the communities around us. Very focused in business, yet delightful and generous in life - that is our Ms. Jessica's style. Ms. Cam Nguyen has joined our team for 6 years. She has a strong background in the fields of Business Administration, Marketing, and especially Events Management. Beautiful, smart, and spirited - Ms. Cam has become a jewel of our team since the very beginning. Customers' satisfaction is always Ms. Cam's first priority. She is very responsive, considerable, and truly care for the partners she works with, either team members or customers. Her motto at work is "to regard, and to be true." Ms. Lila Vo has been with our team since aFishDeal's establishment. She completed her college in the United States and graduated as honored Dean's List in School of Management - both Bachelor degrees of Finance and Bachelor degrees of Business Administration. With a strong background in the field of business, she then became a very successful Analyst of IDC - The Premier Global Market Intelligent Firm; and later, the most dynamic Sales Director of the top export company. Now, we are happy to have her with us! Ms. Lila's goal is to introduce and expand all of Viet Nam's agricultural products to worldwide customers; and she has made great accomplishments during her time with aFishDeal. Ms. Kathy Phan graduated from Ho Chi Minh University with a Bachelor Degree in Business Administration. Before joining us, she has built her great knowledge and valuable experience in the industry of Importing and Exporting. Ms. Kathy is very hard working and highly responsible for her tasks. Being supportive, faithful, and sincere are the slogan that she always keeps in her heart. Ms. Thanh Nguyen has joined our team since 2014. With more than 10 years of experience, she has a very strong background in Seafood Export and Import Industry. Ms. Thanh's passion of learning new things and obligated of completing the goals always make us all delighted to work with her. As Ms. Thanh's partners, you can trust to find her welcoming, cooperative, and reliable. Ms. Linda Van has joined our aFishDeal team since 2015 with a great dynamic spirit after graduating from International Business Management. Passion for the products and Satisfaction from partners are Ms. Linda's source of energy to achieve countless successes. Her deep profound experience has been built on the challenges that she is never hesitated to take. Ms. Linda always does her jobs seriously, and even has a lot of fun doing it. She inspires us to bring premium Vietnamese products to all over the world. Being with our team is like being in the same family with one big common dream. It is her way saying that "We make a difference. We make dreams come true. We are in it together. And it is really exciting!"